It was a day full of exciting moments and a happy team of scientists and engineers — late in the afternoon of October 3, 2018, the German-French lander MASCOT completed its historic exploration of the surface of the asteroid Ryugu at 21:04 CEST, as its battery ran out. On-asteroid operations were originally scheduled to last 16 hours after separation from the Japanese mothercraft Hayabusa2. But in the end, the battery lasted more than 17 hours. Upon landing in the early morning and subsequently relocating using the built-in swing arm, all instruments collected detailed data on the composition and nature of the asteroid. The on-board camera provided pictures of the landing, hopping maneuvers and various locations on the surface. For MASCOT, the Sun set three times on Ryugu. The lander was commanded and controlled from the MASCOT Control Centre at the German Aerospace Center (Deutsches Zentrum für Luft- und Raumfahrt; DLR) in Cologne, in the presence of teams of scientists from Japan, France and Germany. All scientific data was transferred to the mother probe according to plan. 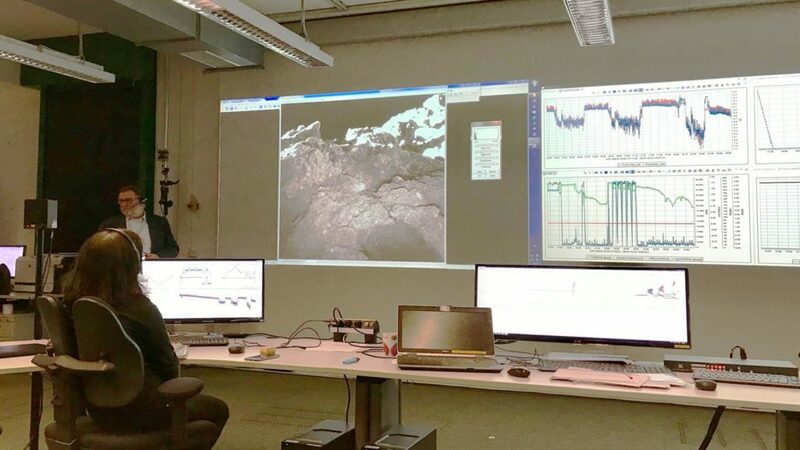 “With MASCOT, it has been possible to, for the first time, explore the surface of an asteroid directly on site so extensively,” says Hansjörg Dittus, DLR Executive Board Member for Space Research and Technology. “A mission like this can only be done working in close cooperation with international partners – bringing together all their expertise and commitment.” With MASCOT, DLR has been working closely with the Japanese space agency JAXA and the French space agency CNES. MASCOT landed safely on Ryugu in the early morning of October 3, 2018. “After a first automated reorientation hop, it ended up in an unfavorable position. With another manually commanded hopping maneuver, we were able to place MASCOT in another favorable position thanks to the very precisely controlled swing arm,” said MASCOT operations manager Christian Krause from DLR. From that position, MASCOT completed a complete measurement sequence with all instruments over one asteroid day and an asteroid night. During the first maneuvers, MASCOT moved several meters to the next measuring point. Finally, and seeing that the lander still had battery power left, the researchers dared to make a bigger jump. All in all, MASCOT explored Ryugu for three asteroid days and two asteroid nights. A day-night cycle on Ryugu lasts about 7 hours and 36 minutes. At 21:04 CEST, communications with Hayabusa2 were interrupted, because of the radio shadow entering with each asteroid rotation. Hayabusa2 is now returning to its home position, at an altitude of 20 kilometers above the asteroid’s surface. In addition to the images acquired by the DLR camera MASCAM, a DLR radiometer, a magnetometer from TU Braunschweig and a spectrometer from the Institut d’Astrophysique Spatiale provided a variety of measurements on the temperature, magnetic properties and the composition of the near-Earth asteroid Ryugu. MASCOT is now a silent inhabitant of Ryugu. Hayabusa2 played a crucial role in the success of MASCOT. The Japanese probe brought the lander to the asteroid. Thanks to precise planning and control, the communication links to the lander could be optimally used for data transmission, so that the first pictures were received on the very day of landing. The remaining scientific data, which was transmitted to Hayabusa2, will be sent to Earth in the coming days. Hayabusa2 is a Japanese space agency (Japan Aerospace Exploration Agency; JAXA) mission to the near-Earth asteroid Ryugu. The German-French lander MASCOT on board Hayabusa2 was developed by the German Aerospace Center (Deutsches Zentrum für Luft- und Raumfahrt; DLR) and built in close cooperation with the French space agency CNES (Centre National d’Etudes Spatiales). DLR, the Institut d’Astrophysique Spatiale and the Technical University of Braunschweig have contributed the scientific experiments on board MASCOT. The MASCOT lander and its experiments are operated and controlled by DLR with support from CNES and in constant interaction with the Hayabusa2 team.